SCIFI opens July 2 its open call with great opportunities for smart city solution owners in the field of mobility, environment and energy. 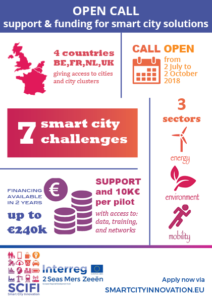 The first call consists of seven challenges, set by the project partner cities, which can be addressed by enterpreneurs (startups, SMEs, studentteams). Each challenge is associated with a city. In the case a challenge has been identified by more than one city in the SCIFI project you may apply to either or all cities. At the end of the accelerator you will have the chance to be selected for a pilot implementation of your solution by the SCIFI cities or the >25 cluster cities. The startups, companies and students will put forward proposals for creating impactful, innovative products and services in response to the challenges defined by the cities in SCIFI. Successful applicants will have a funded opportunity to work closely and directly with cities and city clusters to develop open data based solutions (pilots) to tackle key smart city issues. ● Access to technology and datasets, as well as training and advice by SCIFI experts. How can we use data to encourage cycling for journeys around the city? How can we use data to improve air quality in our cities? How can we use data to improve the city’s approach to treating slippery roads in winter? How can we use data to help cities accelerate retrofitting and stimulate renovations to make older residential buildings more energy efficient? How can we use data to optimize and automate the watering of (public) green spaces in order to realise water and labour savings? How can we improve the way in which we prioritize interventions to maintain cleanliness facilities? Smart Cities Innovation Framework Implementation (SCIFI) is an Interreg 2Seas-funded open innovation accelerator programme bringing together citizens, corporate and public-sector organisations that have smart city needs, challenges and/or data with startups, companies and students that have innovative solutions with data for these needs/challenges. SCIFI enables on the one hand medium-sized cities to create proof of concept that opening their data will create value and better services for their city and citizens. And on the other hand SCIFI enables startups, companies and students to work directly with cities to develop smart city, open data solutions and to scale easily their products and solutions. It is centered around an accelerator programme that facilitates joint and innovative cross-border procurement. The accelerator has several tracks based around challenges set by the cities, and during the accelerator startups, companies and students will develop solutions (with as much citizens involvement as possible) to meet these challenges. The solutions must be conceived in a way that they are applicable in multiple cities (interoperable). SCIFI is funded b y Interreg 2 Seas 2014-2020, a European Territorial Cooperation Programme covering England, France, the Netherlands and Belgium (Flanders) and is being delivered by the cities of Mechelen, Delft, Bruges, Saint-Quentin, Agoria, Faubourg Numérique, Cambridge Cleantech and University of Southampton.